There are two different versions of the Coleco catalog, one printed in Hong Kong and another in the US. This particular catalog was printed in Hong Kong. 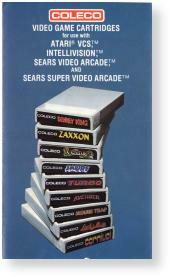 The only differences between the two catalogs are some changes in the game descriptions, and this catalog does not depict ownership of the original game as part of the title (for instance, "Zaxxon by SEGA"). The same nine titles are depicted in both catalogs. Of those titles, six were released and three were not: Lady Bug, Cosmic Avenger, and Turbo. All the games in this catalog are shown as being available for the Intellivision. It's interesting to note that the labels for the games on the front cover of this are obviously mockups, as they don't resemble the final artwork used for the production carts.